City University London has given an Award of Doctor of Science Honoris Causa to Daniel Finkelstein OBE, the Executive Editor and Chief Leader Writer of The Times, for his contributions to electronic publishing. 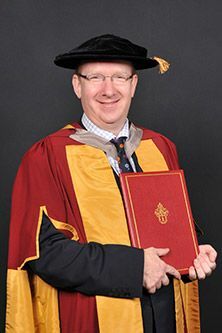 The honorary degree was presented by Professor Ken Grattan, Dean of City's School of Engineering and Mathematical Sciences and School of Informatics, at a recent Graduation ceremony for arts and computing students at the Barbican. Daniel's career is as broad in its scope as it is distinguished. It has encompassed being Editor of Connexion, Britain's first internet and data communications newspaper, directing the Social Market Foundation think tank and acting as a key advisor to the Conservative Party. He is an alumnus of City's MSc in Business Systems Analysis and Design - just a small part of his lifelong association with the University, at which both his father and brother have been academics. Speaking at the ceremony, Professor Grattan commented: "Daniel has been one of the pioneers of the revolution that has brought the UK's best-known and most distinguished newspaper to be a leader in electronic publishing. The Thunderer can now proclaim its message to you every morning with crystal clarity from your iPad, without you having to wait for the paper boy to drop a rolled up copy through your letter box. "Daniel has been honoured many times for his work and I am very proud that we are adding to that list with an honorary degree. He is a renowned alumnus of City University London who brings credit to us with the quality and perceptiveness of his work."